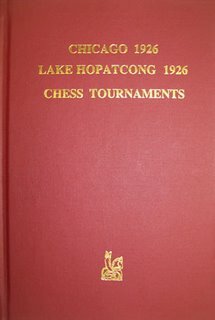 Chicago 1926 Lake Hopatcong 1926 Chess Tournaments. Type: BOOKS. Detail: Sherwood, R. Product Code: 0939433680. This rare harback is a first edition and numbered because there was a print run of only 600. Bob Sherwood wrote this book with research help from Dale Brandreth. Two tournaments are combined within the same hardcover book, which makes sense given the overlap of participants. Sherwood himself annotated every game, with the exception of a few that couldn't be reconstructed. Marshall won the Chicago event, a 13player Round Robin, a half point ahead of Maroczy and Torre. Other notable participants were Jaffe, Kupchik, Kashdan, Showalter, and Edward Lasker. Lake Hopatcong 1926 is perhaps slightly better known because Capablanca participated and won. The event was a closed affair with Capablanca, Kupchik, Maroczy, Marshall, and Edward Lasker. Dale Brandreth provides the historical material for the events and players, with photographs, caricatures, crosstables, and indices.